If respirators are part of your company’s safety arsenal, you know how critical they are in protecting employees. According to the Occupational Health and Safety Administration (OSHA), about five million workers are required to wear respirators in 1.3 million workplaces throughout the United States. Respirators protect workers against insufficient oxygen environments, harmful dusts, fogs, smokes, mists, gases, vapors and sprays. These hazards can cause cancer, lung impairment, diseases or death. Respirators protect users in two important ways. First, they remove contaminants from the air. This type of respirator includes particulate respirators, which filter out airborne particles, and air-purifying respirators with cartridges/canisters, which filter out chemicals and gases. Other respirators protect by supplying clean, respirable air from another source. Respirators in this category include airline respirators, which use compressed air from a remote source and self-contained breathing apparatus (SCBA), which include their own air supply. Respirators can save lives in the workplace. According to OSHA, if facilities comply with its Respiratory Protection Standard, hundreds of deaths and thousands of illnesses can be averted each year. That’s why it’s important for employers to comply with OSHA regulations – not only to avoid citations and costly fines, but also to protect your most valuable asset, your employees. When it comes to using respirators in the workplace, those responsible for safety should know the difference between mandatory and voluntary respirator use, and provide specific procedures and processes for employees accordingly. In its Respiratory Protection Standard, OSHA provides specific detailed respiratory protection requirements that apply, depending on mandatory (emergency) use and voluntary use of a respirator. But whether your workplace is using respirators on a mandatory or voluntary basis, you need to put a written respiratory protection program in place. These steps are critical to ensure your employees’ health and safety as well as to comply with OSHA rules. In OSHA’s list of 2017 list of Top Violations, respiratory protection ranked No. 4 with 3,118 violations cited. Keep in mind, OSHA’s Respiratory Protection Standard (29 CFR 1910.134) requires employees to be fit tested before the initial use of a respirator, as well as when a different respirator is used. If you’re required to wear a tight-fitting respirator at work this month, it’s important to have a clean shave – even if you want to participate in the No-Shave November movement for cancer awareness. Facial hair can interfere with protection and is a common reason that someone can’t be fit-tested. According to studies, even a day or two of stubble can reduce effective protection. Facial hair under a sealing surface can cause 20-1,000 times more leakage than a clean-shaven face. In addition to a fit test, a worker should perform a user seal check every time he or she wears a respirator. 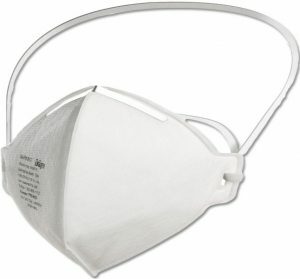 KC Supply offers a variety of respirators and PPE, and more. We can help you select the right respirator for your workplace and your employees. Give us a call at 800.KC.SUPPLY or visit www.kcsupply.com.